Diapering is a Snap with these Diapers. Holds 5 -7 cups of fluid! Can be used as a pull on once snapped closed, as there is plenty of stretch across the back. If you fit into 2 or more sizes, you may prefer the smaller size for daytime use and the larger for night time use. Please keep in mind these will shrink at least 10% after several washings. This product is not waterproof and should be combined with the Silence Pant or other waterproof covering. Designed with both our fully active and low-dexterity customers in mind. A discreet snap on design allows for secure yet easy changes. The elastic at the waist allows for use as a pull up style also. Rearz – don’t compromise, get the best! Maximum absorbency with a 10 layer soaker sewn down the centre. Outlasts other products that may not be absorbent enough for you. 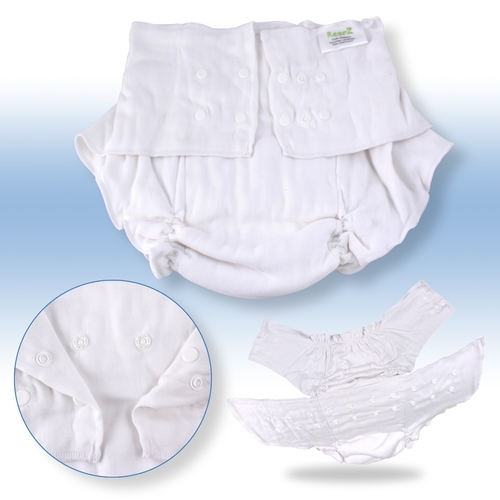 Rearz are Chlorine free Diaper Service Quality Premium Diapers, responsibly made in Pakistan. These diapers are made to the strict European Oeko-tex 100 standards and are "Better Than Organic" and have no harmful chemical residues in the finished product. This means no harmful chemicals! 4-10-4 compressed layering design to maximize absorbency and reduce bulkiness. Heavy duty twill is double woven for durability. These diapers will stand up to years of washing if cared for properly. Do not bleach. Prewash in hot water with vinegar. Machine dry until completely dry to allow for some natural shrinkage for the optimal fit. Wash 2-3 times before use.